Help shape the 2019 SXSW programming by reviewing and voting on session proposals during PanelPicker® Community Voting from August 6-30, 2018. 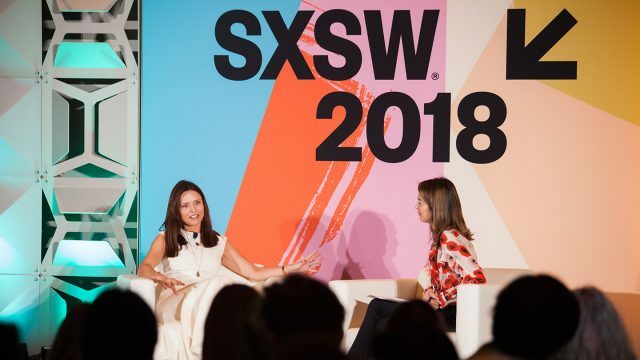 Within the SXSW Conference, Interactive Tracks explore transformative technologies and delve into the latest advancements and ideas from the worlds of business, tech, healthcare, and beyond. For 2019, there are 10 Interactive Tracks: Blockchain & Cryptocurrency, Brands & Marketing, Coding & Development, Design, Entrepreneurship & Startups, Future Workplace, Health & MedTech, Intelligent Future, Style & Retail, and Tech Industry & Enterprise. Have a say in what interactive-related sessions you’d like to see at SXSW 2019. In the SXSW PanelPicker® platform, select “SXSW 2019” under the Conference dropdown menu and then filter proposals by Interactive Tracks found under the Track dropdown menu. Browse the 2019 Interactive Tracks below and learn more about the voting process before you begin. March 14-16 | The Blockchain & Cryptocurrency Track explores the ideas, investors, leaders, policies, and tokens that will be impacting global economics and business. March 9-14 | When building or maintaining a brand, learning how to engage a consumer and create brand loyalty is vital to success. With emerging markets in mind, learn from creative strategists in the industry on creating campaigns by way of data, neuroscience, storytelling, and tech trends with the Brands & Marketing Track. March 9-12 | New for 2019, the Coding & Development Track approaches technological advancements for engineers, coders, developers, and programmers, with a truly interactive and educational experience. Workshop format only. March 8-12 | The Design Track covers how design informs our interactions, shapes our experiences, and plays a critical role in problem-solving. Attendees gain clear ahead-of-the-curve design-related takeaways that they can apply in their professional lives. The majority of sessions in the Design Track are solo presentations. March 8-12 | The Entrepreneurship & Startups Track brings together founders and funders of all stages to talk about current best practices as well as the most exciting new companies and services across industries. March 9-13 | The Future Workplace Track brings together HR, talent, and corporate leaders to discuss innovation and forward-thinking initiatives that will impact the future and design of today’s workplace. March 8-12 | The Health & MedTech Track focuses on the new technologies and approaches being applied to health, medicine, and well-being, including a deep dive into how the ecosystem of patients, providers, and payers interface with technology to improve health in the communities where we live, work, and play. March 8-14 | The Intelligent Future Track embraces burgeoning and transformative technologies that are embedded in everyday life. Programming will explore the impact of technologies such as artificial intelligence, deep machine learning, connected devices, and more. March 8-11 | The Style & Retail Track features conversations around technology’s ever-evolving role in shaping the in-store & e-commerce experience, sustainable & smart fabrics, customization, innovations in beauty, and conversations around diversity and inclusion. March 8-14 | The Tech Industry & Enterprise Track focuses on the forward-thinking innovation of today and what we project to be trending tomorrow. Join executives and leaders from a variety of industries to discuss the evolving landscape of technology driven services. To begin, visit panelpicker.sxsw.com/vote and login or create an account. Please note, if you created a SXSW account in 2013 or later, you will be able to use the same login and password. Have you entered a session into the 2019 PanelPicker? Gain online support for your idea and encourage voting by using our handy “Vote For My PanelPicker Idea” graphics across your personal or company social media channels. Join us for another exciting event March 8-17, 2019 in Austin, Texas. Register to attend and then book your hotels through SXSW Housing & Travel.